Garden rooms make great games rooms! A place for all the family to escape and play and spend time with friends. A garden games room can be designed around your intended use. This example, by Garden Spaces, was designed so that is could house a pool table and act as an occasional spare bedroom. A lot of people are buying a garden room for use as a home office but it doesn’t have to be all work and no play when buying a garden room. As these photos from Crusoe Garden Rooms prove, a garden room can be a place to just relax. We recently did a feature on garden room buildings being used as snooker & pool rooms, this recent project by My Eco Space is a great example to add to the list. Do you like a game of snooker or pool? But, don’t have space in your house for a table? Well, how about creating a room in the garden tailored around your favourite game? A fine example of a games room in the garden by Swift Garden Rooms. The room has been designed for fun today but is flexible for any future use. 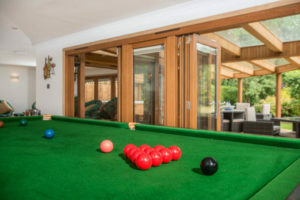 Creating a games room is a popular use for a garden room, this guest post outlines the things you should consider when creating a games room in the garden. Garden rooms make great games rooms, this recent build by Sanctum Gartden Studios is an ideal retreat for a growing family.